Jacques Cartier sailed up the St Lawrence as early as 1534. Initial settlements were essentially set up to trade in furs. 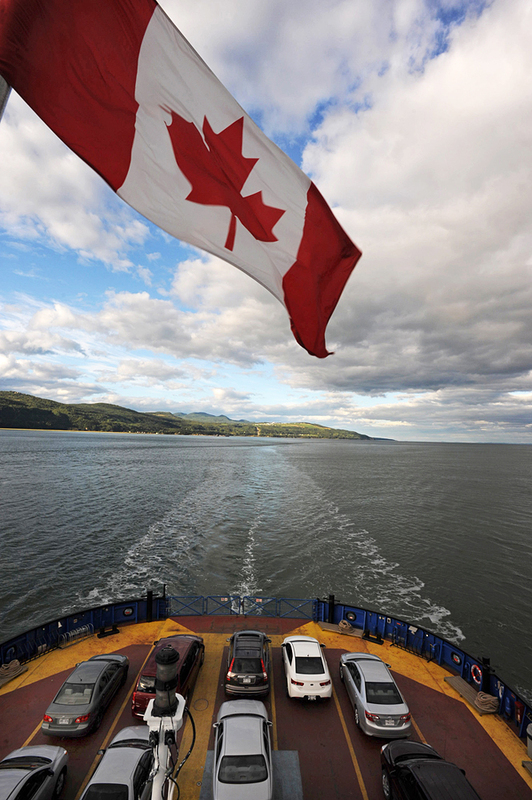 A remarkably diverse province is Quebec, second only in size to Nunavut………. I have travelled many times to Quebec. My wife is French Canadian and her extended family live there. It’s a wonderful place to see and experience. Being the french speaking part of Canada, it has always felt like an interesting mix of Europe and North America. 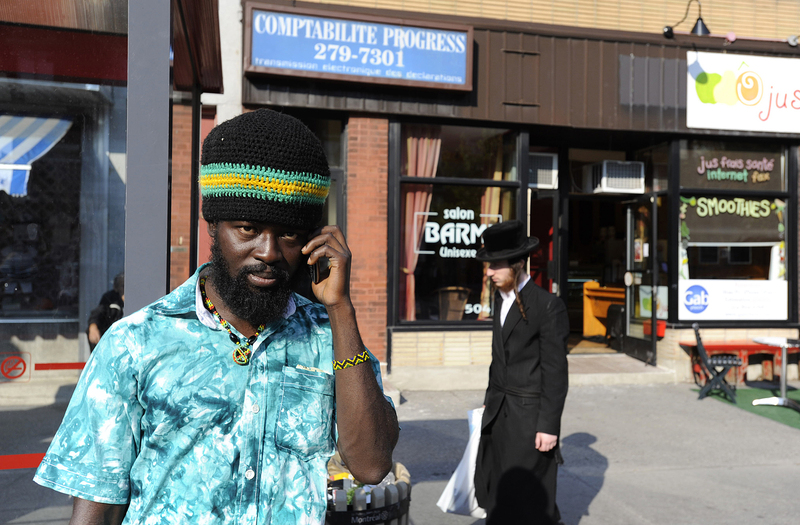 Montreal, wonderfully cosmopolitan, expressive and vibrant. An artistic feel is evident in so many ways, and pleasingly, is generously exhibited in the public arena. Its architecture, colonialist inspired or modern and imaginative, I have always thought a fantasic mix. It is however, as it is on most occasions, forays into the country that most inspire. While retaining that North American feel, their attention to detail is superb, a certain style, charming and quaint. 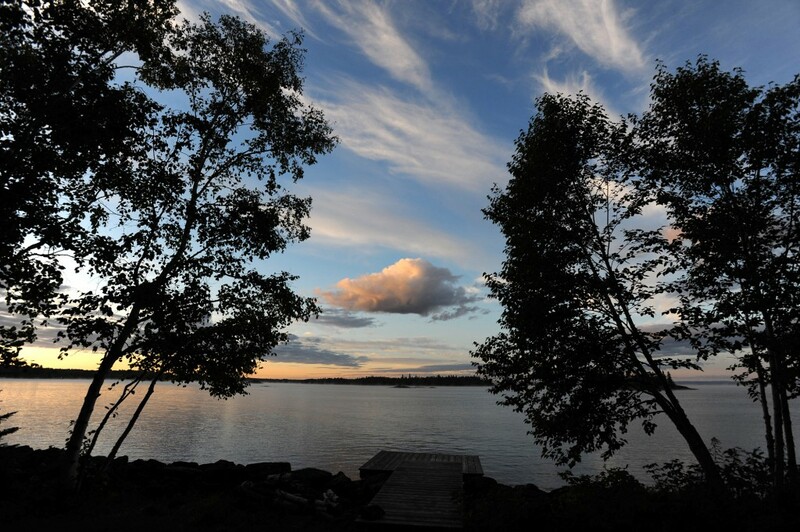 Time spent on L’Ile aux Coudres, a small island in the St Lawrence, illustrated this aspect perfectly. 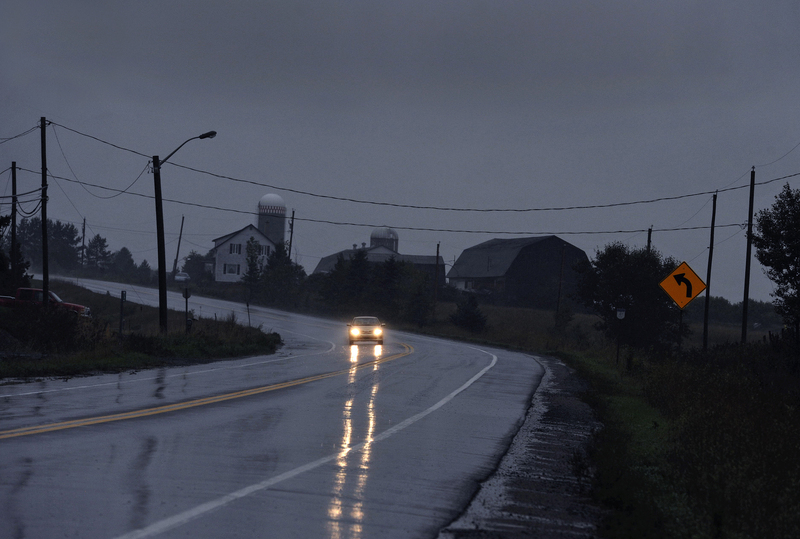 So to, a sidetrip to Beauce, down towards Vermont on the US border. The real getaway came when heading 600 km’s north from Quebec City via Chicoutimi to an area called Lake St John. With our Ford Flex packed to the gunnels, and only just enough room on the back seat for camera gear, (readily accessible of course), the journey is made on what I would say are the best roads in the world. A far cry from the majority that are required to get us to, well lets say, the ends of the earth type destinations, the ones more often than not we normally take. A good playlist, definitely a hotdog or two, and a moose sighting if you keep your eyes peeled, and are really lucky, got us there, and all in armchair comfort. My sister in law and her partner Jacques cosy chalet awaited us, fully equipped, and the most wonderful base from which to explore the lake and its surrounding areas. Although only a modest few degrees to the north, there was evidence that the leaves were turning, and the process that preceeds the long winter had already begun. The days were still sublimely warm, with no hint of summer abating. If the night had been clear and cool, Jacques and I would often rise at first light to survey the potential for heading out on the lake. 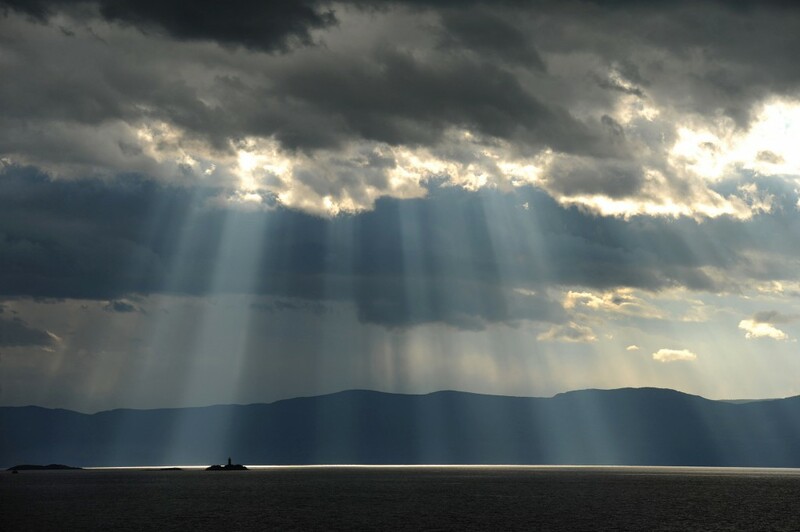 The weather, water and light, always different, gave rise to an expectation as to what wonderful experience might lay ahead. Some days when the conditions allowed we would travel 40km’s or so, to survey the mouth of some of the big rivers that feed the lake. One day heavy fog rolled in, blocking out the sun, dropping the temperature substantially, and diminishing visibility to such a point, that navigating became almost impossible. Trips like this afford more time in which to reflect, catch up on old friends and enjoy lunches and dinners. Smoked trout, mushrooms picked locally from the forest and sometimes topped off with the amazing dish that is blueberry or strawberry pie, picked wild of course. This all comes with the inevitable down loading and editing that is part and parcel of photography. While not always welcome or timely, dealing with it on a regular basis, makes for a smoother and relatively trouble free landing on the return home, where, after thirty plus hours and the jetlag that accompanies it, you will get to see the fruits of your labours, and truly appreciate the visual record of your most recent journey. 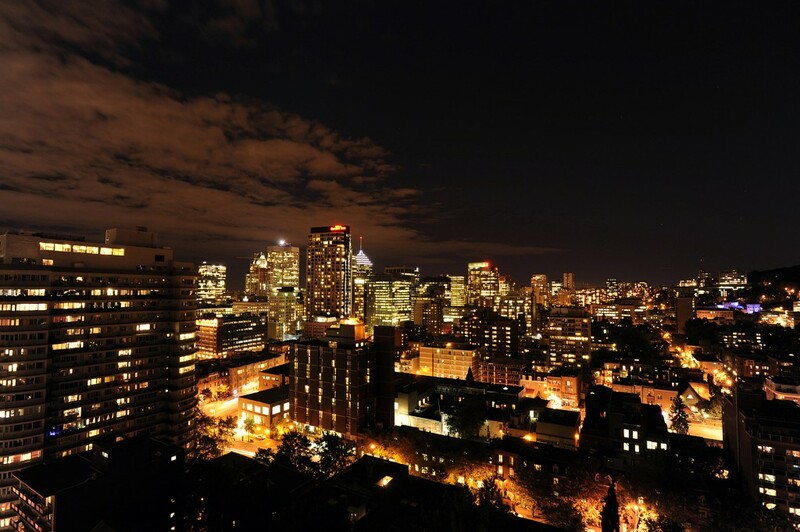 The lights of downtown Montreal, Quebec’s largest and most vibrant city. 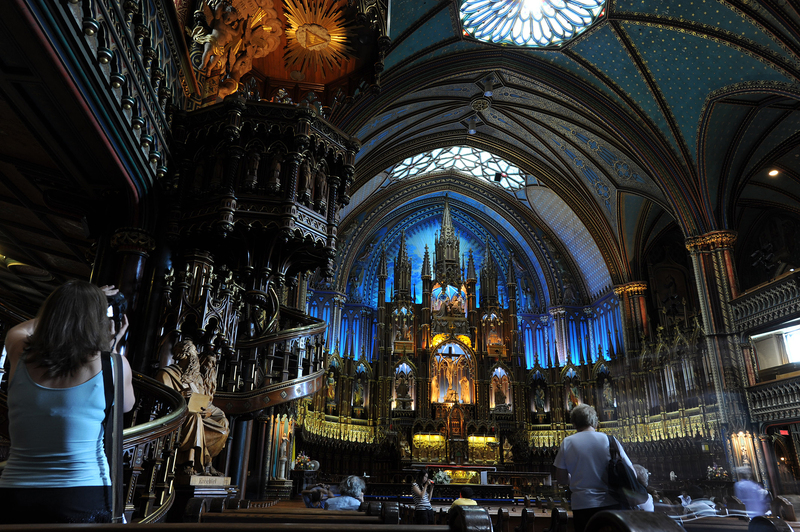 As with many large North American cities, Montreal is home to a wide variety of cultures. 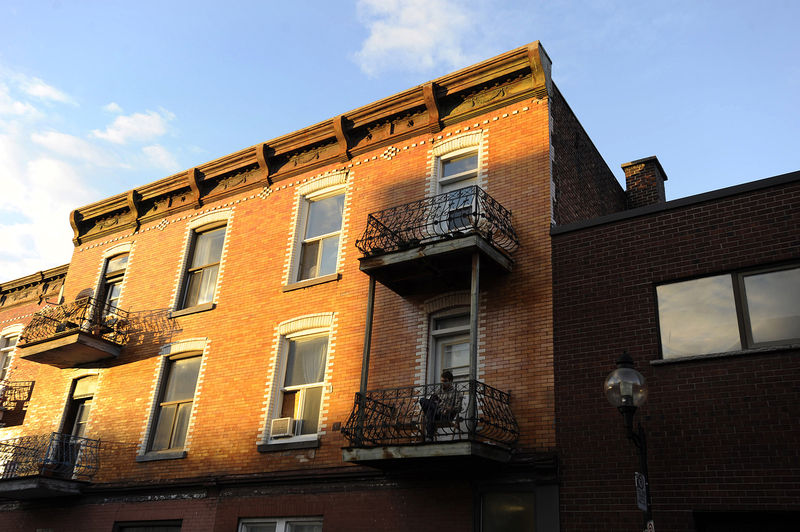 Even on the smallest of balconies, people would catch a ray of sunshine. Evidence that, in general, summers are short, and winters are long, too long. There to see a photographic exhibition in another section of the cathedral, I could not resist a look, like many other visitors seen here making their own photographic record of this most magnificant structure, Notre Dame. 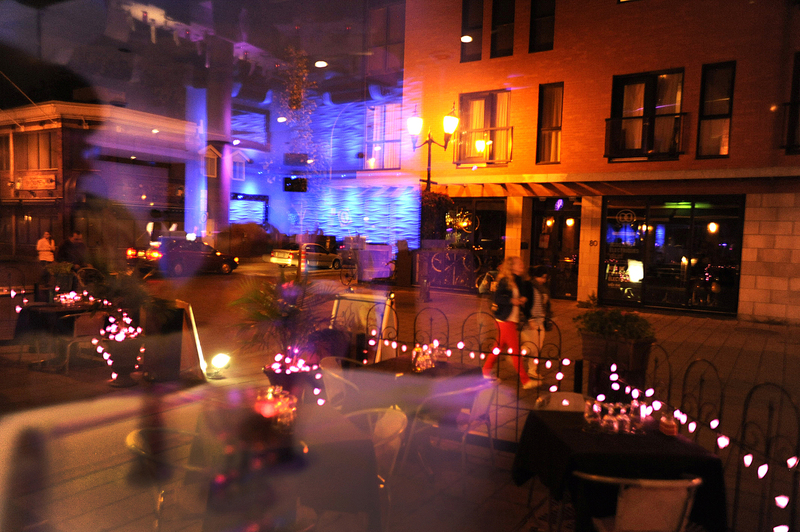 Night life, restaurants and bars abound around Rue Saint-Laurent. 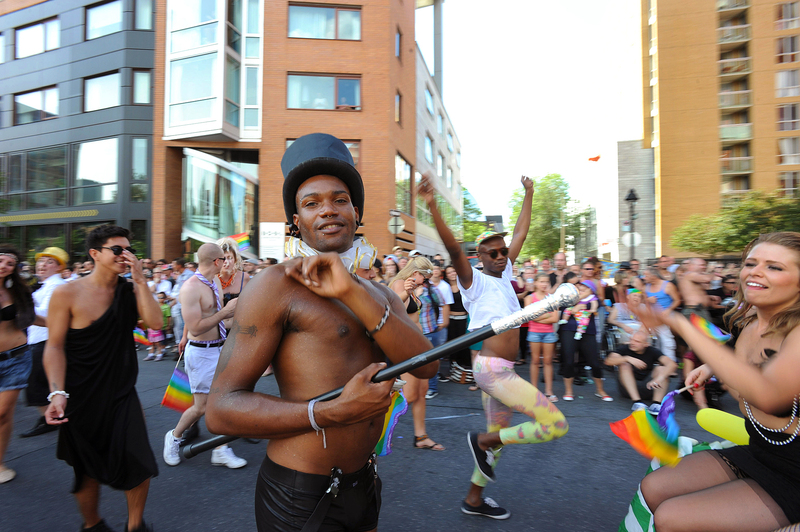 Great weather helped make for a huge turnout at the 2012 Gay Pride parade in Montreal. Montreal’s Gay Pride parade in full swing. 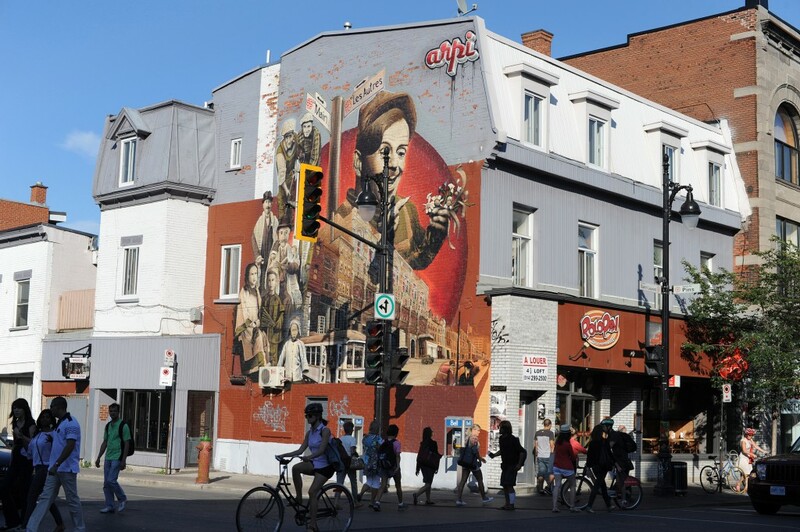 Wonderful murals like this one on the corner of Saint Laurent and Des Pins, abound in many areas in and around downtown. 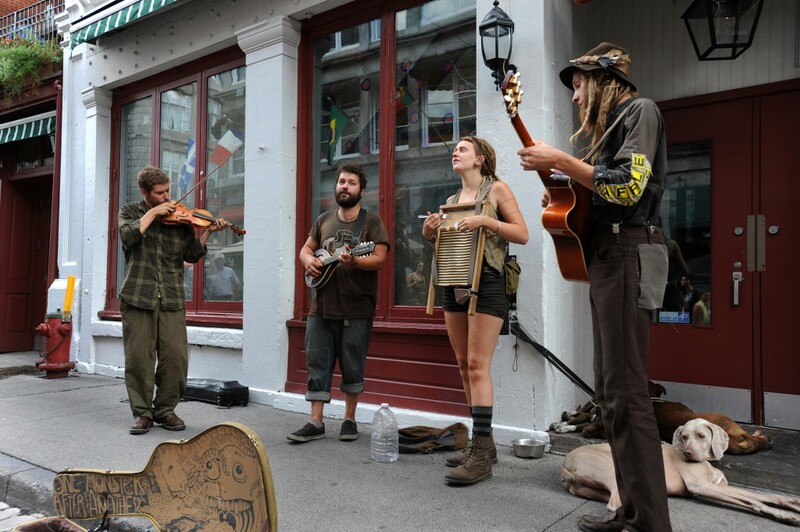 You mention busking in Quebec and the name of Guy Laliberte, a partner in the founding and creation of the world renowned Cirque du Soleil will invariably come to mind. These buskers really made fantastic music and reaped the benefits of an extremely generous crowd of visitors, both local and international. 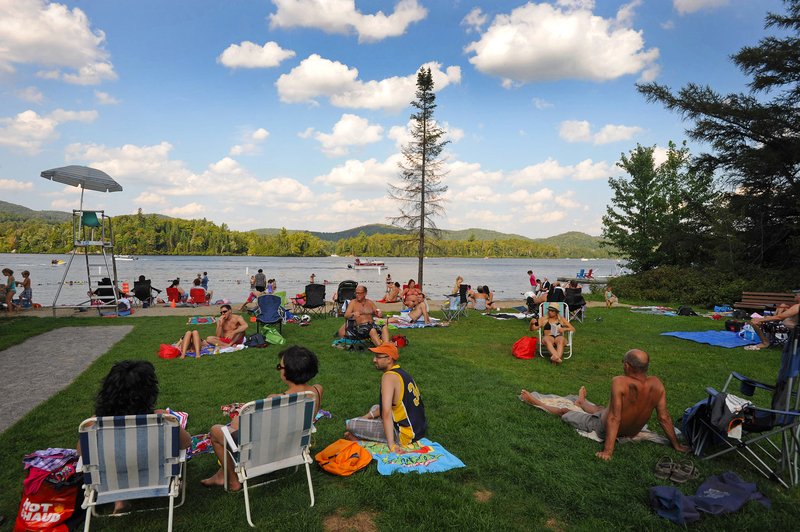 Beach goers in the tiny vallage of Saint Adolfe de Howard in the Laurentians, make the most of the last of what they say was the best summer ever. As far as the eye can see. 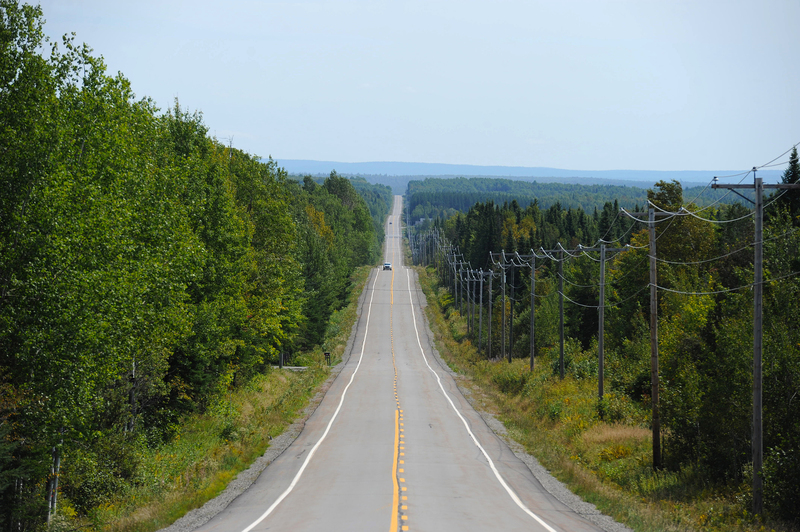 This secondary road on the way to Beauce and ultimately the boarder and the State of Vermont in the US. The ferry across to L’Ile aux Coudres on the St Lawrence River. 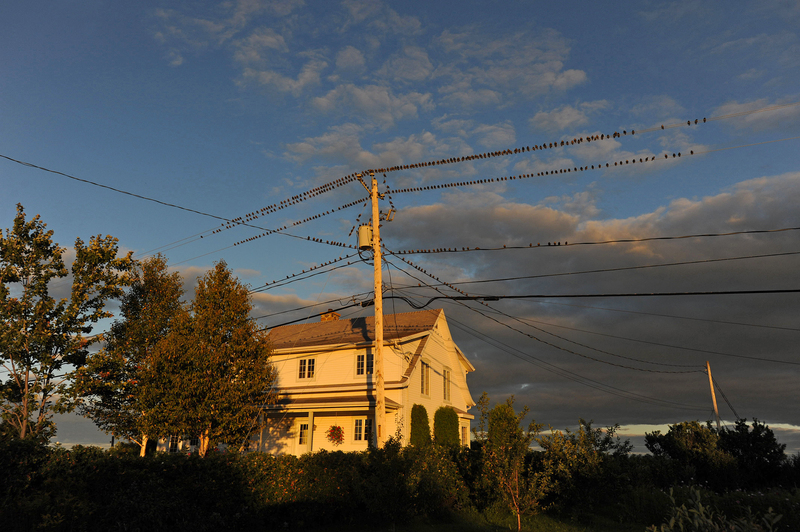 Birds gathering at sunset, L’Ile aux Coudres. An unusual sight at St Henri on L’Ile aux Coudres. Probably created by the by the very high tides the St Lawrence can experience. The tides in nearby bay of Fundy, new Brunswick are the highest in the world. 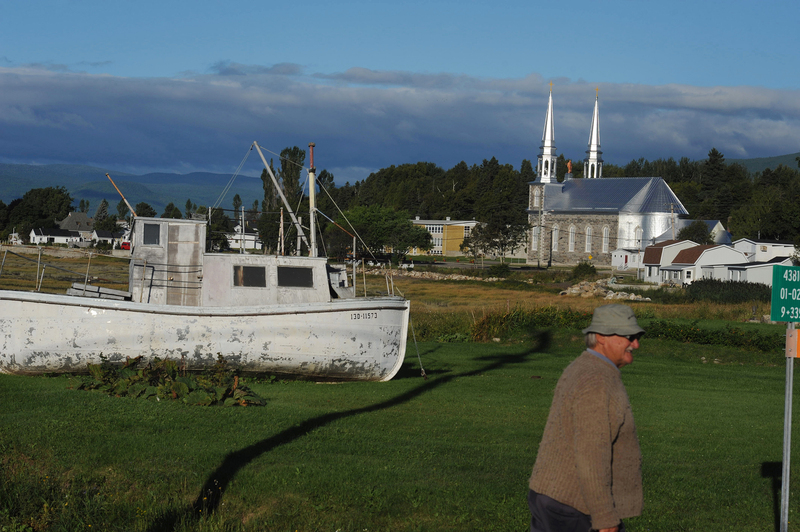 Chapel St-Isadore on L’Ile aux Coudres is maintained by the local faithful. 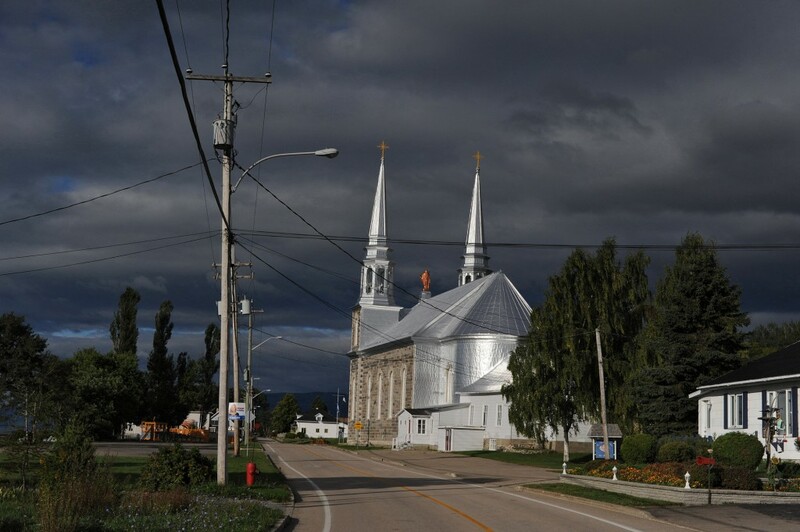 Even the smallest communities like this one in St Henri on the L’Ile aux Coudres, have their church, something central to their patrimoine (heritage). Travelling through the countryside is literally a journey from one spire to the other. Mostly painted silver, they shine brightly, acting as landmarks to all. 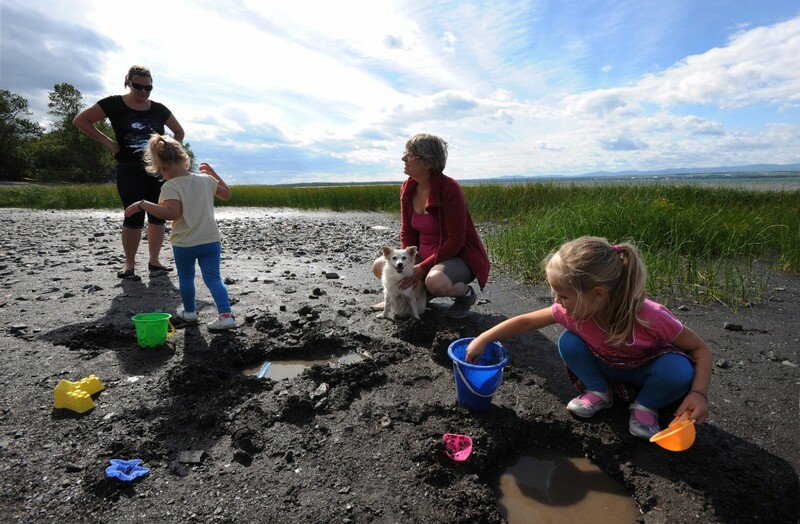 Here on the western shore of the St Lawrence, three generations of one family, along with their pooch, enjoy yet another perfect summer day. 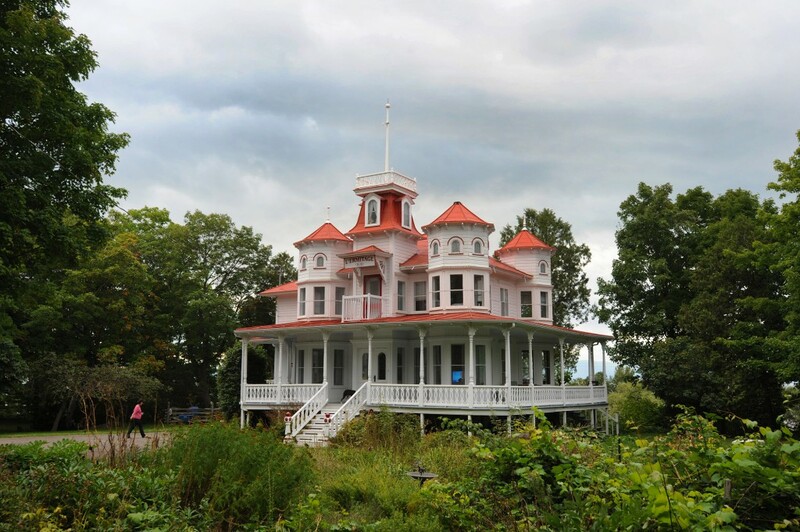 This wonderful house in St-Jean Port Joli is now an Auberge (guesthouse), and was the former home of a prominent sea captain and his wife dating back some 150 years. Beautiful late afternoon ‘godlight’ bathes the St-Lawrence River and the abandoned island of Pillars of Stones, whose lighthouse and community was razed to the ground by fire a century ago, but never rebuilt. After twenty something days without rain, finally some leadened skies and the heavens opened. 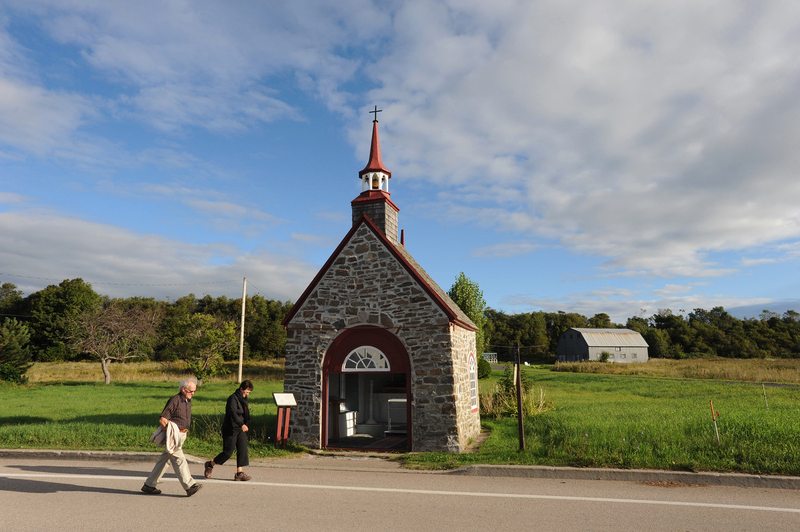 For a time, everything around St-Coeur de Marie became fresh and green. 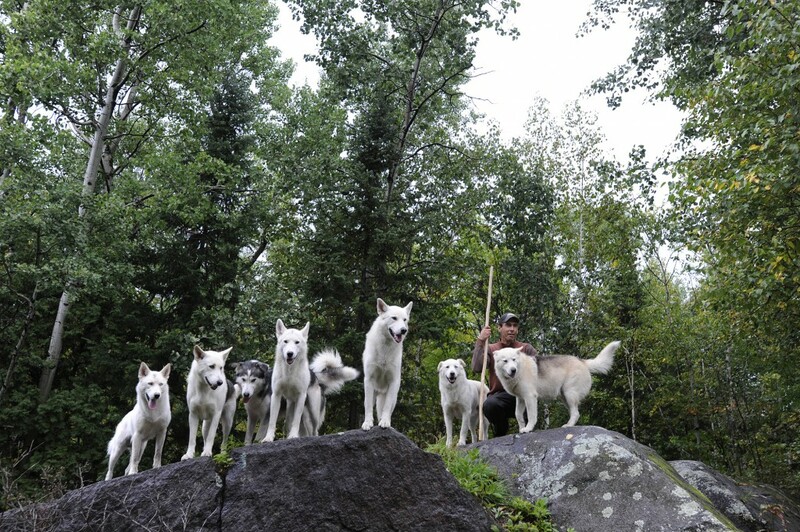 These Alaskan Malamutes are used by their owner and handler as a sled dog team during the long winter. 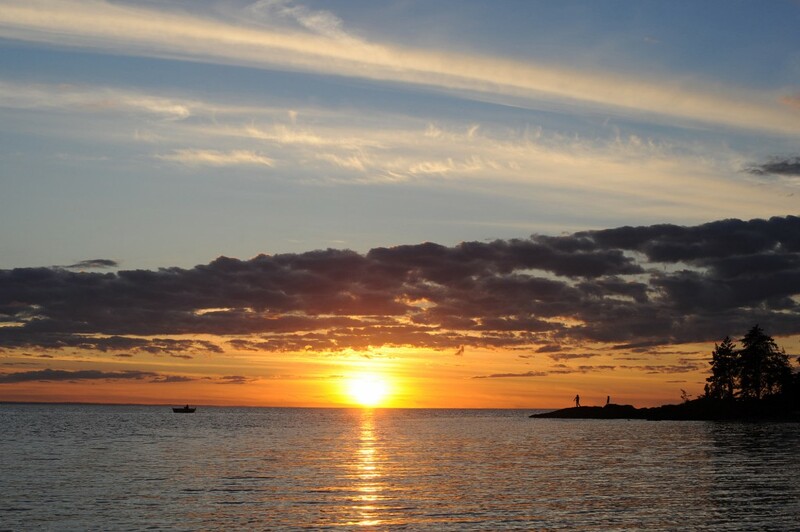 With the sun sinking below the horizon of Lake St John, a man fishes peacefully as his daughters frollick nearby. 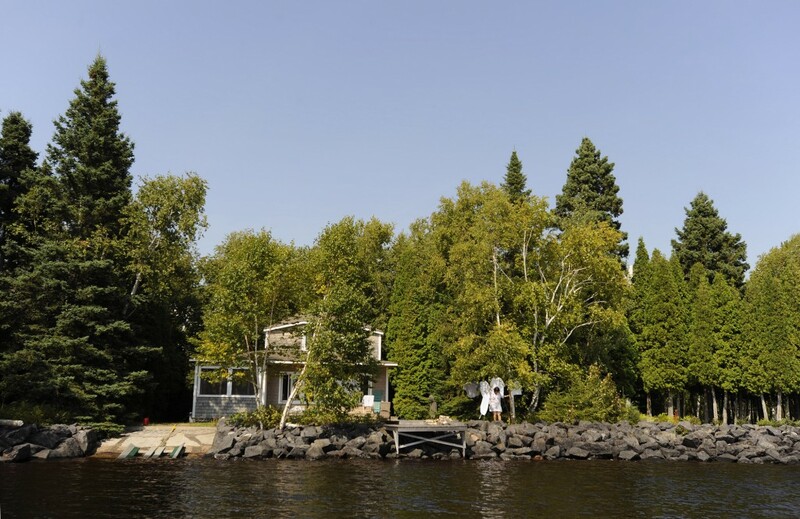 This chalet on Lake St John is the country getaway and belongs to my sister in law and partner, and is a superb base from which all exploration takes place, whether on land or on water. 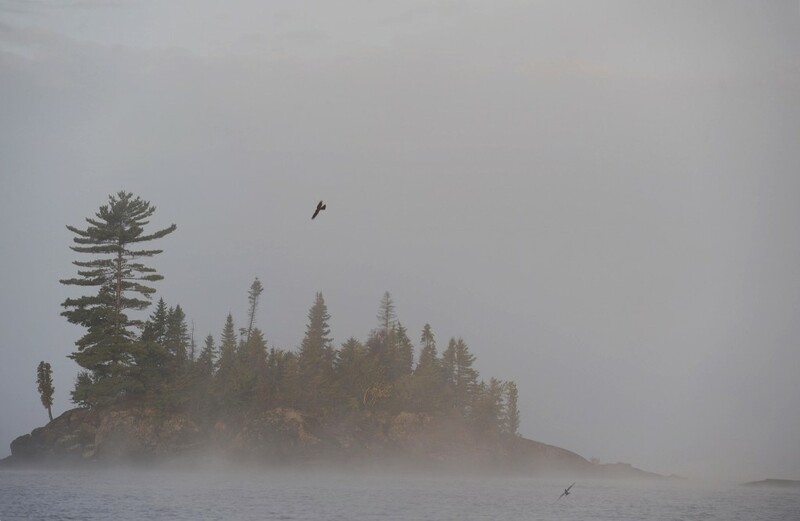 At 80km’s in diameter, Lake St John creates its own weather. With the disparity between air and water temperatures, fog and mist can provide early morning atmospherics. You have to be up real early and invariably will not see nor hear another boat. Once having cut the motor, and from first light, the early mornings were fresh, silent and allowed time to view and digest the sublime beauty as the fog lifted and the hidden landscape was revealed. Only calls of the occasional bird pierced the air. With a storm raging all night, there are bound to be incidents. 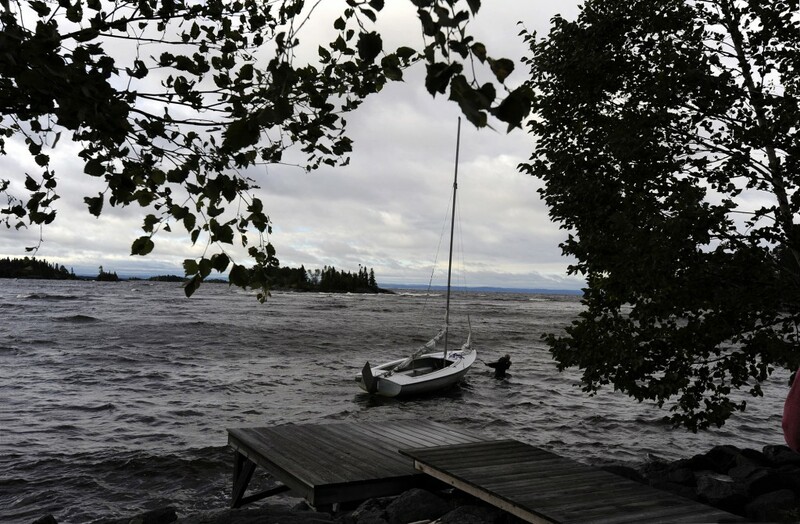 In this unusual scene at Point Wilson on Lake St John, a man, waist deep, tows his yacht back to it’s mooring after having rescued it from where it had run aground on the shoreline nearby. By late afternoon the scene had changed markedly. 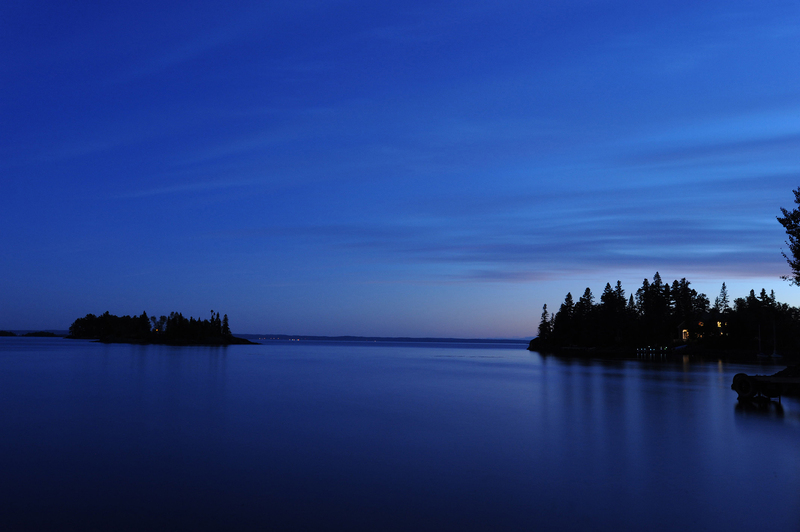 At twilight, lights pinpoint the location of chalets on nearby islands, some just not visible during the daylight hours. The lights on the far shore are from a town with the wonderful Indian name of Metabetchouan.